﻿﻿In an essay titled “The Pleasures of Eating,” the American writer and farmer Wendell Berry says this: “A significant part of the pleasure of eating is in one’s accurate consciousness of the lives and the world from which food comes.” Berry, who has been speaking in support of local and healthful food since long before it was the trend, is one of the most eloquent proponents of traditional and sustainable food systems— a state in which what we eat is produced, harvested and processed by people we know in ways that we understand, and in which our food is sourced from natural surroundings that have meaning to our daily lives on both practical and spiritual level. Simply put, sustainable and pleasurable eating is about being close to our food and the creation that supports us. Here on the coast, we’re hugely fortunate to live in the midst of a pristine environment that provides us with some of the purest food experiences possible—fresh salmon for the barbecue, for example, or stinging nettles for nettle pie, or mussels and goosenecks shucked off the rocks for seafood stew. It’s this closeness to product that Tofino and Ucluelet’s culinary culture is built on, and it also forms the centre of Feast! Tofino-Ucluelet, a new festival that takes place this spring from May 8th to June 5th. A month-long celebration that brings together chefs, farmers, foragers and fishermen, Feast! was originally conceived as a series of events to spotlight locally produced seafood and the sustainable boat-to-table practices commonly used by many of the area’s chefs and the Tofino Ucluelet Culinary Guild. In a number of ways, Feast! will be going farther than other food events that have been held here in the past. For locals and visitors alike, the festival is structured to provide a range of opportunities to learn about the area’s food culture, from its traditional First Nations roots to the new forms and collaborations that have emerged in recent years. Among the highlights are educational tours, tastings at local hotels and restaurants, dockside preparation demonstrations and themed salmon, crab and spot prawn weeks. The month of Feast! will culminate with the ninth annual Tofino Food & Wine Festival and its Grazing in the Gardens gala. The festival will also be hosting a number of accomplished chefs from farther afield—Angus An, Rick Moonen, Hayato Okamitsu and Peter Zambri among them. Though much of Tofino and Ucluelet’s culinary scene depends on tourism for its survival, Feast! is a demonstration that there’s much more going on here than simply slinging food to tabletops. In the same way that mutually beneficial relationships exist between chefs and producers, the festival is helping to foster relationships between those who visit here and those who make their livings in the coast’s food community. Those who work here are sustained economically and are given the pleasure of sharing something of fundamental value, while those who visit are fed well-sourced good food and are shown how healthy and sustainable local systems can function in an increasingly industrialized world. There are a lot of people here who work hard to make sure that food is done right—and when food is done right and shared right, it becomes a thing of true and lasting pleasure. One imagines that Berry would approve. For more about Feast! and a full festival schedule, see our Feast! Tofino-Ucluelet page or visit feastbc.com. The first Annual Feast! 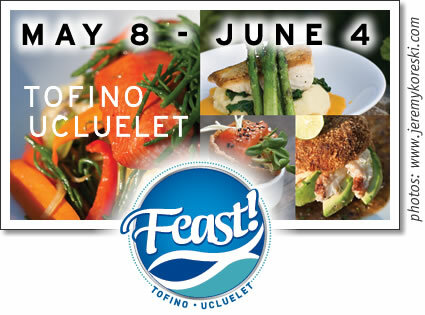 Tofino-Ucluelet, a month-long culinary festival takes place for the first time in May 2011.